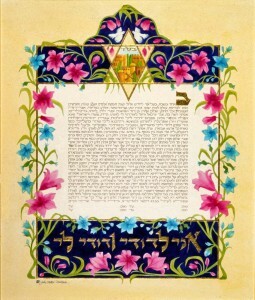 The Hebrew word “Ketubah” means “document”. The Ketubah was originally created as a legal document to protect a woman’s rights and is given to every Jewish bride by her groom. The content of the original text was very progressive for its time, over two thousand years ago. At that time a woman could simply be discarded by her husband, with no provision for her economic welfare. In an era when women had no rights, the Ketubah became a form of protection. It defined the obligations of a husband to his wife, and provided for her in the event of his death or a divorce. The original Ketubah text was written in Aramaic. The common language spoken at its inception, Aramaic uses the Hebrew alphabet. 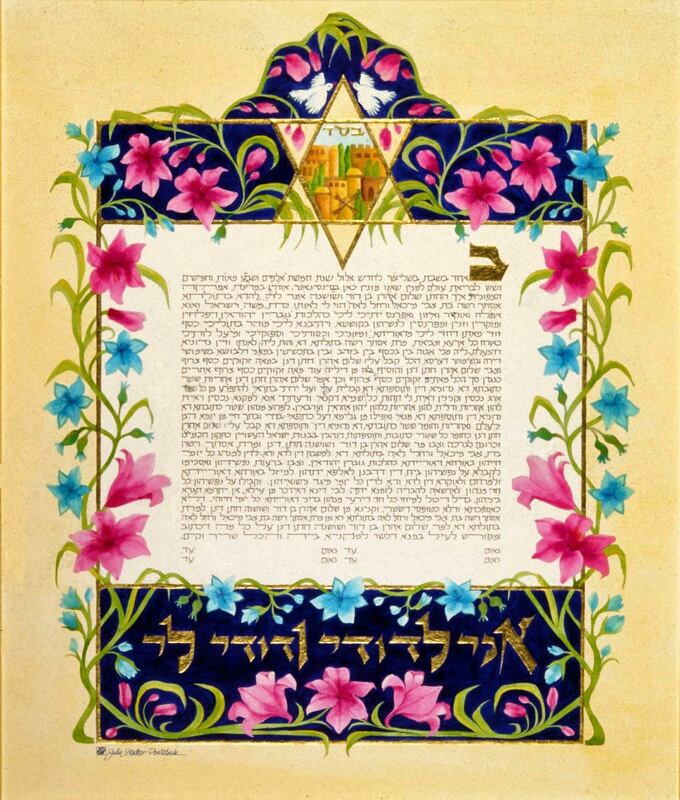 It is not known for certain when the practice of illuminating the manuscript came into being, however there are many examples of beautifully decorated Ketubot (plural of Ketubah) that have survived throughout the centuries from all over the world. Today, Ketubot are created with many different text options: from traditional to contemporary, Orthodox, Conservative, Reform, and those composed by the bride and groom themselves. While the Ketubah was originally a revolutionary document, today this ancient tradition has been updated and adds beauty and joy to the wedding ceremony.